Oskia Renaissance Mask. Enriched with superfood fruit extracts of grape, lemon, grapefruit and papaya, the natural active acids gently unbind dead and tired surface cells for a light exfoliation to reveal a renewed and radiant complexion. When life gives you lemons, take them in any way, shape or form - they have a whole host of anti-inflammatory properties and are high in Vitamin C, as is grapefruit which also contains powerful anti-oxidants. Grapes too are loaded with vitamins, nutrients and are a leading source of resveratrol, the plant chemical responsible for heart-healthy benefits, and the vitamins and antioxidants in papaya work together to fight cell damage and promote skin renewal. Origins Drink-Up Intensive Mask. As the name would suggest, you'd expect this treatment to house some pretty thirst-quenching ingredients, and that it does; I picked out the fatty and fruit seed oils from the inci list and stumbled across olive, avocado and coconut oils, all up there in terms of being rich in fatty acids and nutrients. Berries are jam-packed with anti-oxidants that fight free radicals, that's where the blackcurrant seed oil comes into play - did I mention that this mask smells like all kinds of tropical fruitiness? It steps into my routine once every other week and my skin likes to think of it as my 8-glasses-of-water-a-day, in-a-tube. Perricone MD Chia Serum. Wave hello to my pre-moisturiser step fave from Dr P which bottles up instant glowy skin goodness. Using rare extracts of chia oil and fat soluble essential vitamins, this quick-sinking serum multi-tasker turns dull skin days upside-down resulting in a healthy, nourished complexion. Cold-pressed, extra virgin and unrefined, it's both amino acid and anti-oxidant rich, and is the highest vegetable source of Omega 3, these little seeds have a lot going for themselves and not only does this grease-free treatment protect from oxidative stress, it brings a whole new level of moisture and nutrients to the skin. 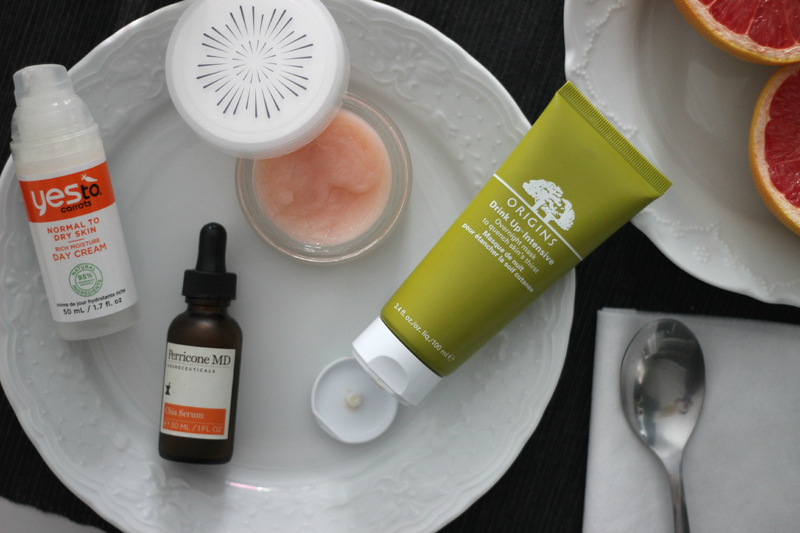 Yes to Carrots Rich Moisture Day Cream. When dry skin days attack, I reach for a layer of this as my morning time moisturiser - the clue's in the name as carrot root extract is one of those found on its list of ingredients. High in vitamin B6, vitamin's A, C, K and potassium and paired with all-good-fats avocado oil, makes an incredibly nourishing formula. Spirulina, a type of algae also crops up - it's protein packed and contains essential amino acids the skin needs. Overall? A pretty good all-round, nice 'n' natural day cream. I'm absolutely loving the Origins drink up mask! I'm always trying to get my fiance to invest in his skin and this is one of the very few treatments he's willing to use regularly which says a lot! Gotta love superfoods they do the body so much good. This means that you actually kill fat by consuming coconut fat (also coconut milk, coconut cream and coconut oil). These 3 researches from large medical magazines are sure to turn the traditional nutrition world upside down!